I have just returned from a weekend away Lecturing in Denmark where I found many enthusiastic and skillful growers of alpines, bulbs and rhododendrons. It was interesting to see that over there, plants were at about the same stage as ours are. Whenever I have been away from home, I always like to have a walk around the garden to see what has changed; come with me. 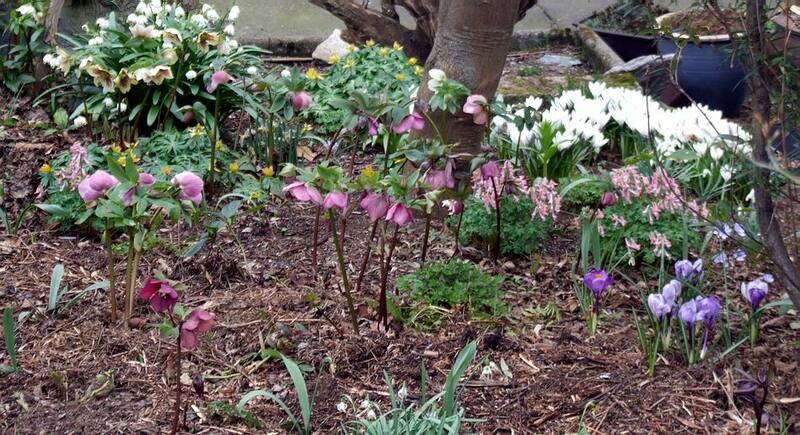 The hybrid hellebores are now starting to open to show their lovely flowers. We have been building up a small colony under an Acer palmatum both by bringing in plants and allowing them to seed around and every year some flower for the first time often revealing a great beauty. A good dark spotted form very obligingly holds its flowers up, so it looks at you rather than facing down, this is a very desirable feature in breeding hellebores. 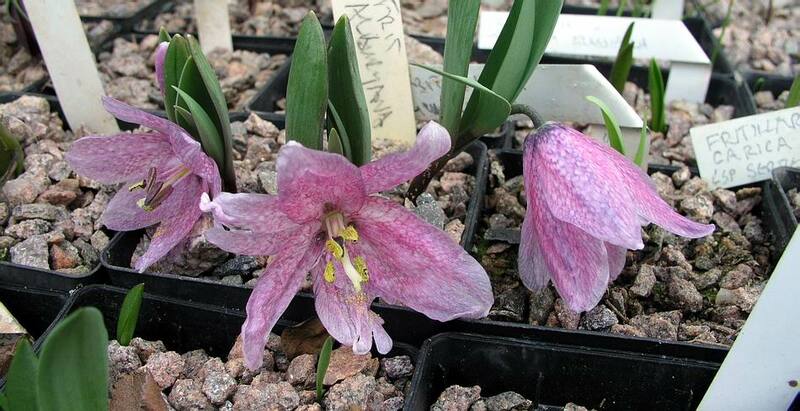 On the right is the very beautiful Helleborus thibetanus which has lovely pinky purple flowers that remind me of the colour of Fritillaria alburyana. 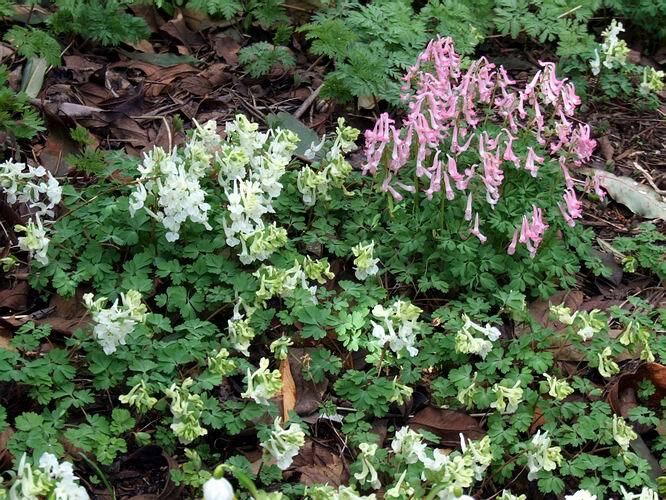 It is always a delight to see the corydalis coming through and they are second to none of the other bulbs for bringing bright cheery colours to the very early spring garden. Their exotic looks and colours belie the toughness of these plants which often have to survive being covered in snow in our garden and they always reappear almost unscathed when the thaw sets in. I still hope we can avoid late snow this year. 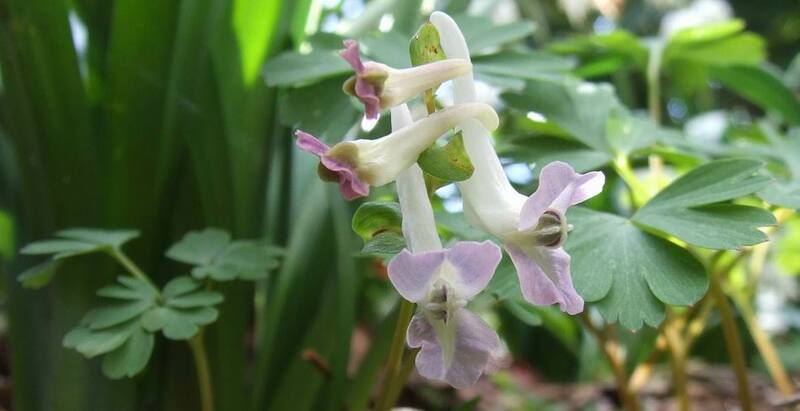 While the solida type corydalis increase steadily by division of the tubers, Corydalis malkensis only seems to increase by seed. Luckily it always produces plenty seeds without the need for outside help with the pollination. I have never noticed any great numbers of insects visiting the flowers and I do not pollinate them but we always get a good seed set so I suspect that they are capable of self pollination. There is sometimes some evidence that insects may have been involved when I find some flowers with a purple colouration. Have they crossed with the solidas or is this a natural variation within C. malkensis? I do not know. Perhaps when I am viewing the garden every day I am not so aware of the changes so when I have not seen it for three days the changes look dramatic. Many bulbs seem to have moved on rapidly, responding to the sunny days we are now experiencing as they rush into flower. Crocus tommasinianus in all its forms increase both by division and by seeding around and as long as you are in control this is very desirable. 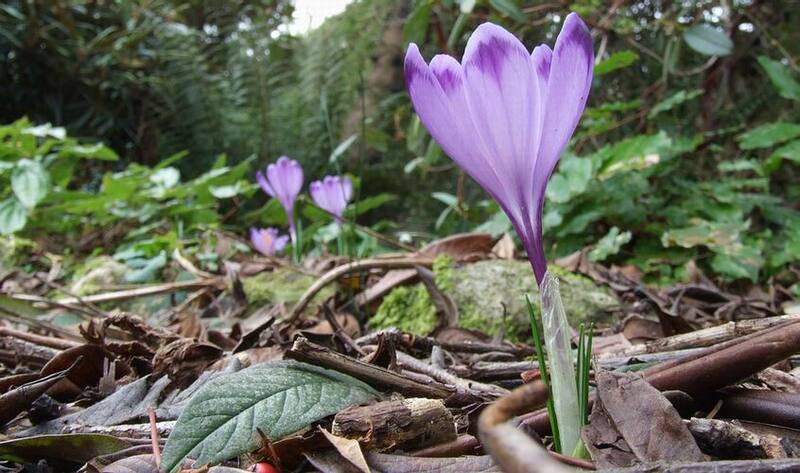 In one area of the garden a number of Crocus vernus heuffelianus are flowering. I did not plant these, some are in the middle of a path, so they must have come from seed and that gives the garden a very natural look with individuals and small groups well distributed around. 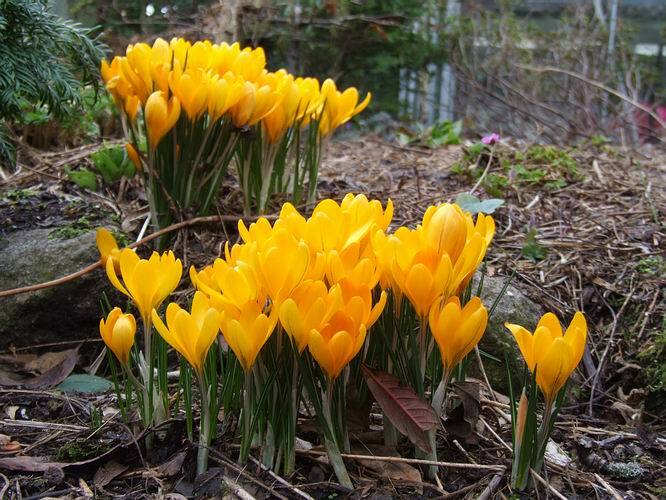 The other extreme is the large groups of crocus cultivars like this yellow one, I cannot remember its name, which are formed as the corms continually divide to form dense clumps. These clumps have probably reached their peak as if I let them get over congested the competition for nutrients becomes too much and the flowering will diminish and I will just get masses of leaves and no flowers. Sometimes it is difficult to re-establish the flower production after this has happened. I will have to split these clumps this year and will show you how and when I tackle this task, in a future log. This is a nice Crocus vernus seedling I found in the garden a number of years ago - it occurred close to where we grow some of the big Dutch vernus cultivars where there are also some collected Crocus vernus albiflorus growing. 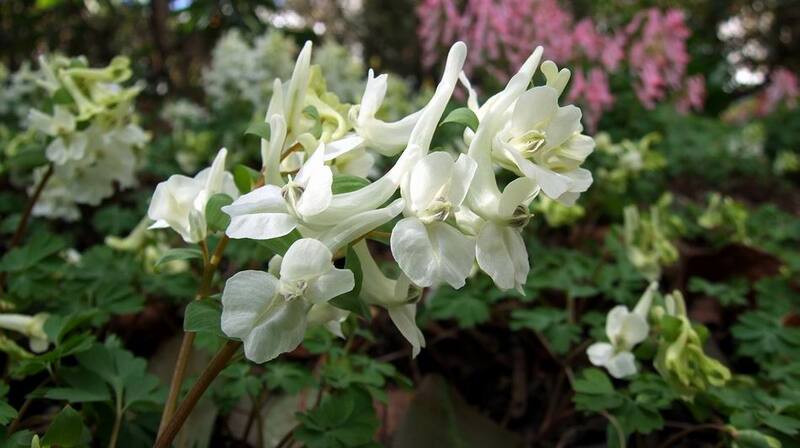 In size it falls somewhere in between the two and it has very nice white flowers with violet lines down the floral segments to the violet purple tube. Increase has been steady but I must also split this group as I think there were more flowers on it last year. 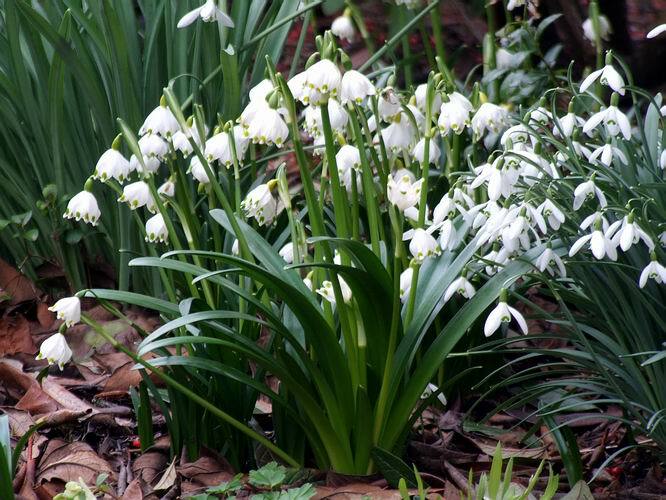 I am hearing that the snowdrop season is all but over in the south of the country but here in Aberdeen we are still enjoying them as they are still not all out yet. I can just imagine the Galanthophiles moving north en-masse, following the snowdrops like nomadic herdsman following the food in the pastures on an annual cycle. Narcissus cyclamineus is also in full flower and as the pollen is also ripe I will have to get out there with my paint brush to ensure a good and plentiful seed harvest later in the year. We also have lots of Leucojum vernum in all its variation of yellow or green tips to the petals and these are also just coming into full bloom - will look at these in more detail next week. So much has shot up in the bulb houses in the few days I was away that it is difficult to know what to show you, but here are a few. 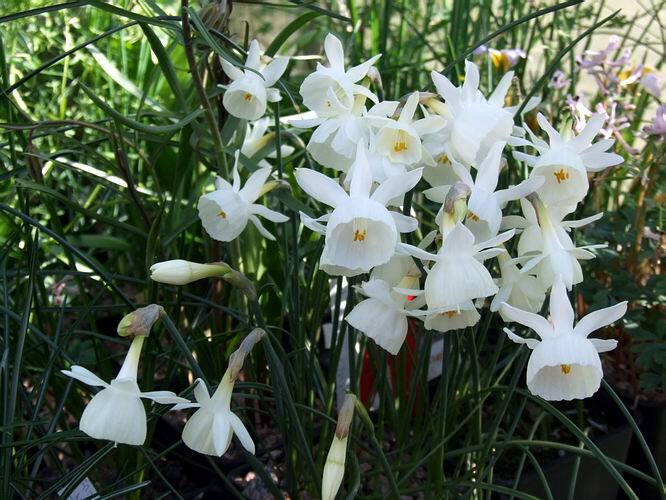 Narcissus x susannae (my own hybrid imitating the naturally occurring Narcissus triandrus x N. cantabricus) is looking stunning as always, I think it is one of my favourites of all the Narcissus. Fritillaria crassifolia is among the many frits that are also now in flower and if the sun keeps shining I will be very busy with the camera as they all come into bloom over the weeks to come. 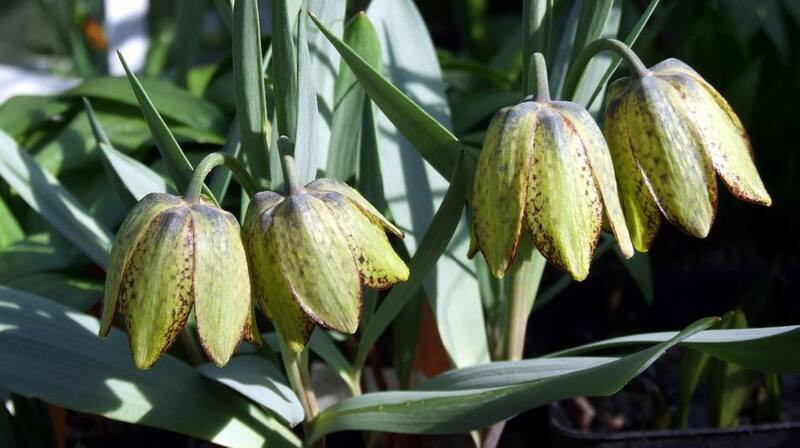 Fritillaria alburyana was in flower the day I left for Copenhagen and this is the picture I took then. 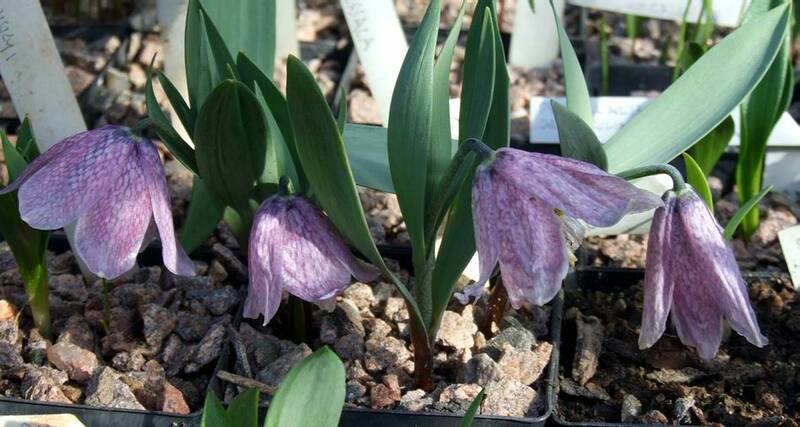 It has a wonderful colour just like that of the Helleborus thibetanus, pictured above, and combined with a very short stem, it is a very beautiful fritillaria. For comparison here is the same plant photographed the day after I came home. You can see how the stems have extended and the colour of the petals is fading; a good sign, I hope, as I pollinated it last week and the fact that the flowers are fading quite quickly suggests that the seeds have been fertilised. I will watch with my fingers crossed and hope that I see the stem turning to hold the seed pod upright, another positive sign of good seed. I must not take this for granted however and I will continue to move pollen from the stamen to the stigma on a daily basis to give the plant every chance to produce a good crop of seed for me.